Hi! I have recently been trying to create a replay function to my game. However it has not been so easy. With 4.12 I see they have added the sequencer and the ability to record. 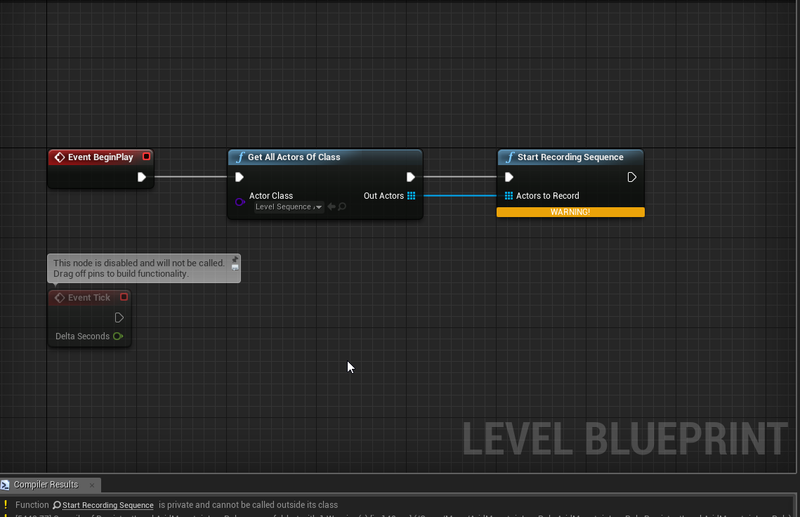 I noticed that there is a blueprint node for "start recording sequence" and one for "stop recording sequence". My goal is to use these to record and playback later. However i am getting a warning that the nodes cannot be used outside of their class and I have not found any way to do so. Does anyone have any idea how this is done or if it is possible? Can you please tell me which node? start recording sequence" and "stop recording sequence"
However you could probably use a "get all actors of class" node and get the specific sequencer class and specify them thru individual tags. Note the screenshot is from level blueprint. I apologize since I have not really messed with this before however the documentation may have some useful information on the subject. I have already looked into that and as far as I can see, it only covers the sequencer from the editor and not in blueprints. Anyhow i appreciate the help! Converting actors to BP breaks animation?